This was another of the random requests I did on Tumblr. 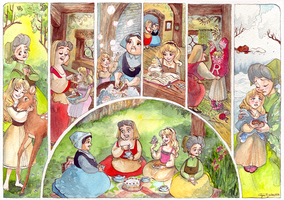 The brief was to portray Disney princesses enjoying a little tea party but they all had to be portrayed the same age as their respective movies (for example Snow White would be 75 years old, Aurora 53, Belle 21, Rapunzel 2 etc). 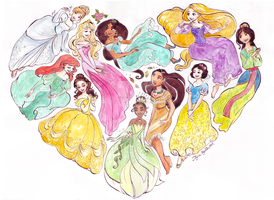 Left to right: Tiana, Cinderella with Rapunzel on lap, Snow White, Pocahontas, Belle and Aurora. So it all went maybe a little Downton Abbey but I really liked doing this. Welp! A Daily Deviation! Thank you so much!!!! Oh my god! Little Tiana is cute! I adore this piece. I love seeing them their ages as they would be from their movie's point of view! Can someone do this but with Doctor Who companions? Yes. Can someone listen to this guy. She is a genius. It's another of the things that I like reading about. As well as being one of the most fitting for this. Susan\Ian\Barbara would be 53, Vicki would be 51, Steven would also be 51, Dodo would be 50, Ben\Polly would also be 50, Jamie would also be 50, Victoria would be 49, Zoe would be 48. Liz would be 46, Jo would be 45, Sarah would be 43, Harry would be 42, Leela would be 39, Romana I would be 38, Romana II would be 37. Adric would be 36, Tegan would be 35, Nyssa would also be 35, Turlough would be 33, Peri would be 32, Mel would be 30, Ace would be 29. Bernice would be 24, Grace would be 20, Fitz would be 17, Compassion would also be 17, Charley would be 15, C'Rizz would be 12. Rose, Jack, and Mickey would be 11, Donna would be 10, Martha would be 9. Amy and Rory would be 6, Clara would be 3, Nardole would be 1, and there's a pregnant (6 months along) woman in the distance to imply that Bill (the person who would be Thirteenth's main companion along Nardole. Played by Pearl Mackie) is unborn. I want to draw this so bad but I can only draw ponies......I'll look for a dress up that could let me do that. Although I would only do the New Who companions as I haven't watched any of the classic who. Well. Doctor Whooves is popular. That is a cool idea with the ages! lovellyt art work!this remind me a family photo that i have in my room with my family from 1830,it,s dated 1900.but i love your watercolor work! This art is amazing! Very well done. Thank you for the lovely art. but I love older!Snow White, Cinderella, and Aurora! What an amazing idea! Well done! First saw this a a few years ago, still love it to bits. I think, and i'm here for some years now, that THIS is my favorite art EVER. Geez, would that mean that Cinderella is 62? Wow. Hey how old is Pochahontas? Well Pocahontas' film came out in 1995 so following this logic she'd be 19. Love this piece. You should really do another with Ariel, Mulan, Merida, and the others. I love this piece! It actually reminds me a lot of some of Renoir's work, it has the same type of feel. Plus the concept is totally cool. I don't think I've ever seen anything like it before. I am really tired of the media's obsession with youth so thank you for this. Everyone aged so gracefully! 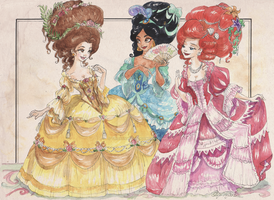 Did you have a particular historical period in mind when designing the princesses' outfits, or were they merely meant to be similar to what they wear in their respective films? Bit of both, I took colours and shapes from their film outfits where I could and then mashed it with 1920s Edwardian England afternoon tea setting (hence my comment about going a little Downton Abbey on it). ...You made Snow White look...like my grandma. ...She's just like her in every way. Cinderella is the most beautiful ! But the drawing is wonderfully made in general ! 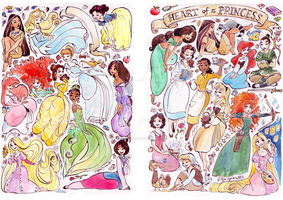 Please oh please do all the disney princesses next time!